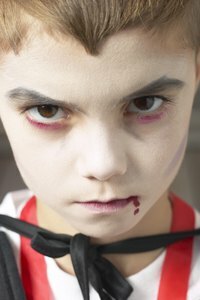 Fake blood is the ideal accessory for many Halloween and theatrical costumes. You can use it to make a zombie costume look more frightening, or you can use it to make drips of blood on Dracula's face. Oftentimes the fake blood you buy at the store stains skin, making it difficult to remove. Fortunately, you can make homemade fake blood that wipes off easily and won't stain your skin. Mix a cup-and-a-half of water with one-and-a-half tablespoons of flour with a whisk in a small pot. Stir until the it is completely blended and smooth in consistency. Put the pot on the stove over high heat. Allow the contents of the pot to come to a boil. Reduce the burner to medium heat. Allow the flour and water to simmer for 20 to 30 minutes. Stir occasionally. Remove the pot from heat. Allow the contents to cool. Add red food coloring one drop at a time. Stir each drop in with your whisk and keep adding drops until your fake blood has reached the desired color. The fake blood will stain clothing.